We looked at every ERP vendor on Salesforce, and none of them came close – on feature set, on ability to deliver on time. Direct Energy Solar began in 2008 as Astrum Solar, a full service solar provider. Its mission – provide solar power to America while focusing on delighting the customer and providing the most positive experience possible. The resulting rapid growth led to Astrum being named twice to the Inc. 500 list of fastest growing companies in America. In July 2014, Astrum became part of the Direct Energy family, and in 2015 renamed their brand to Direct Energy Solar. 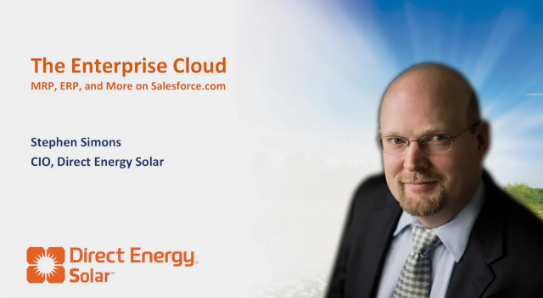 What does Stephen Simons, Direct Energy Solar CIO, attribute his company’s tremendous success to? In 2010 he decided he wanted to build the entire business, from the front office to the back office and everything in between, on the Salesforce Platform. Pretty much every aspect of our business is covered by Rootstock, from purchasing to work order management, to field service and maintenance, bill of materials… everything. Prior to Rootstock, the company had monthly inventory adjustments of nearly 5%. Since implementing Rootstock in 2012, that adjustment has decreased to less than $10,000 every month, and we’ve grown over 2000 percent. Direct Energy Solar is part of the Direct Energy family, one of the largest retail providers of electricity, natural gas, and home services in all of North America with nearly five million residential and commercial customers and $19.4 billion in revenue in 2014. Direct Energy provides customers with choice and support in managing their energy costs through a portfolio of innovative products and services. Direct Energy operates in 50 U.S. states plus the District of Columbia and 10 provinces in Canada. To learn more about Direct Energy, please visit www.directenergysolar.com. Direct Energy Solar began in 2008 as Astrum Solar, a full service solar provider. Its mission - provide solar power to America while focusing on delighting the customer and providing the most positive experience possible. The resulting rapid growth led to Astrum being named twice to the Inc. 500 list of fastest growing companies in America. In July 2014, Astrum became part of the Direct Energy family, and in 2015 renamed their brand to Direct Energy Solar. Established in 1979, Pacer Group (Sarasota, Fla.), is a leading wire and electrical cable manufacturer that offers custom electrical products, value-added solutions and parts distribution. The Pacer group of companies has expanded beyond its traditional marine industry focus at its 42,000 square-foot manufacturing, assembly and warehouse complex in Sarasota. Our array of capabilities begins with wire and cable manufacturing and progresses with customer focused solutions such as battery cable assembly, wire harness assembly, instrument and dash panel design, and complete electrical system integration. Pro-Tech Manufacturing and Distribution, Inc. (Rochester, NY) revolutionized the snow and ice management industry when they launched the Rubber Edge Sno Pusher in 1994, which has helped thousands of snow and ice companies across North America move more snow faster, thereby increasing efficiency and profitability. Since then, they have never stopped working to craft the perfect containment plow, striving to increase the already extreme durability and functionality of their product line. Learn how Unionwear has used and implemented the dynamic features of Rootstock ERP in their manufacturing process and how Unionwear is bringing Manufacturing back to America. Unionwear is the trade name, URL and DBA of New Jersey Headwear Corp., which manufactures and embroiders headwear, bags, accessories, work wear and safety gear. Unionwear currently operates a 45,000 sq. ft. manufacturing facility in Newark. Unionwear sells through a nationwide network of several hundred promotional products distributors. As the premium paid for domestic production shrinks, more and more markets are enforcing labor standards in their procurement, such as colleges, federal, state, and local governments, as well as corporations with strong union workforces – for employee gear, and non-profits. For the past ten years, Unionwear has focused on providing products to clients requiring products to be made in the USA and is not forced to compete with imports on price. The US military and federal government accounts for half of the business with clients like labor unions and presidential campaigns representing much of the balance. 1st Light Energy is a fast-growing company and a leading installer of custom-designed solar energy for residential, commercial and public sector applications. We have offices on both coasts and thousands of successful installations from Hawaii to Massachusetts. There is no question that we would not be as successful as we are without switching to a Cloud AppExchange manufacturing ERP a little over a year ago. Here's why.